SitNGo Wizard (aka SNG Wizard) can make you into a formidable sit and go player faster than you would have ever thought possible. This slick little program is part of a new class of training tools consisting of an ICM calculator and some automation to make life easier when hunting for the correct play. And it works! You can find the correct play immediately and learn how to think for yourself as you go along. It won't be long until you play the final 20 or 30 hands of a sit and go with absolute perfection; a very profitable skill to have! SitNGo Wizard is the most powerful of the Automated Independent Chip Modeling programs, or AICMs. Although all three of the well-known sit and go tools are fairly similar, SitNGo Wizard holds an advantage due to a bevy of unique features it includes. Plus, it has a free 30-day trial, with a regular price of $99. SitNGo Wizard is a great tool for learning a very solid short stack strategy. By far, the most popular sit and go format today is the Turbo format. The blinds grow very rapidly, so you can’t just fold your way to the money. 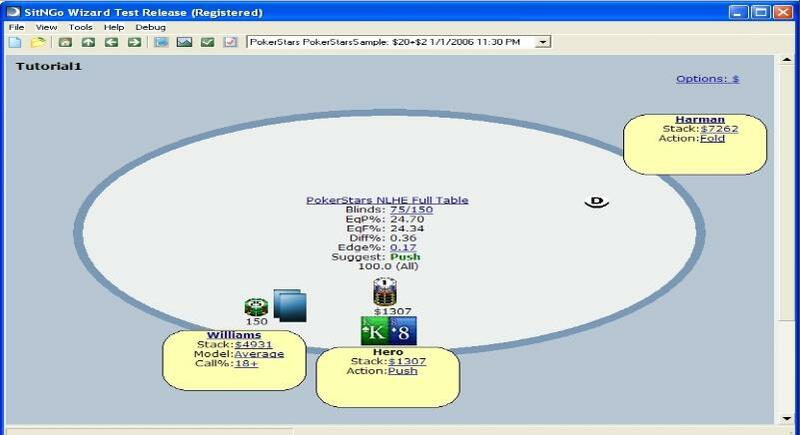 It is not uncommon to still have six or seven people left in a single-table tournament when the average stack size is about five big blinds. At this point, you have to know what your ranges are for calling or pushing all-in pre-flop so that you can have an edge over your opponents. By playing a high enough volume and making the correct mathematical plays, you will have an advantage. SitNGo Wizard will help you learn what the correct ranges are in a fraction of a second. With SitNGo Wizard, you can use the Quiz feature, import your own hands, and get instant reports on how you're playing. The quiz feature allows you to customize your quizzes for difficulty level, number of players, table position, and several other parameters. Each question gives you a game scenario and the option to shove or fold. You will then make a choice and the quiz will keep a running total of your results. This is a solid tool to develop your decision-making skills. 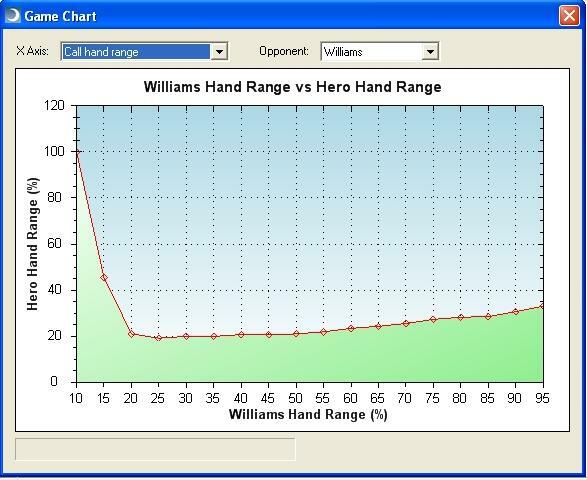 SNG Wizard also has a feature called Future Game Simulation (FGS). This is a feature that attempts to compensate for the downfall of the ICM method of short-stacking. 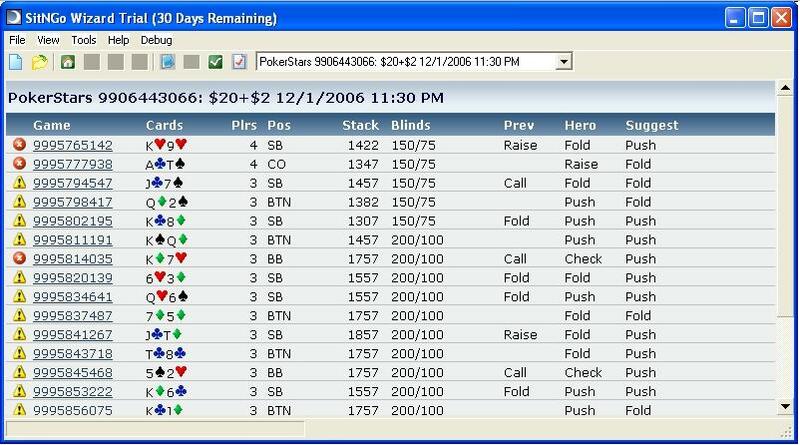 For example, ICM only accounts for the current hand. It doesn’t take into consideration factors like the big blind being forced all-in on the money bubble. In general, ICM tends to undervalue medium stakes, so it’s usually better for medium players to play tighter because the value of shorter stacks busting is very high. Also, ICM tends to overvalue short stacks, because, again, ICM doesn’t take into consideration the short stack's probability of busting in future hands. SitNGo Wizard’s FGS option will help take your short stack play a step further by allowing the simulator to take into consideration future hands. The graphics aren't beautiful, but the program is fast, slick, and easy-to-use, with a graphic interface that works intuitively. It will teach you how to play nearly perfect late-stage sit and go strategy. The late stages are where the money is. How well are you really playing? Get SitNGo Wizard and find out.